We all know that discussions about good dietary habits and nutrition take place every day almost everywhere. Families talk about it at home, teachers discuss it in schools and doctors, nurses and registered nutritionists discuss good nutrition with patients. Many people believe that flavor must be sacrificed when eating nutritious foods. This is far from true. Some research confirms that taste is more important than nutrition when choosing one food over another. Realistically, the foods people enjoy most are usually the ones they eat. Therefore, setting healthy eating standards that also satisfy the taste buds is important to family nutrition. The Academy of Nutrition and Dietetics promotes National Nutrition Month in March to show how to mix good taste and nutrition with healthy meals. This year’s theme is “Savor the Flavor of Eating Right.” Check out the 7 Kitchen Staples for Teen-Friendly Meals. As part of the 2016 National Nutrition Month® theme, Greater Houston Orthodontics in Houston TX encourages everyone to choose foods from each of the five major food groups every day. We support all efforts in getting the word out about nutrient-rich foods and drinks. We all need foods that provide vitamins, minerals, protein, carbohydrates and other essential nutrients with fewer calories. Our team recommends your family diet include healthy foods like vegetables, fruits, whole grains, lean meats, poultry, fish, eggs, fat-free or low-fat dairy, beans, nuts and seeds in the right amounts. This will help maintain a healthy body weight in conjunction with a healthy exercise routine. Also, for your kids, try this delicious “No-Bake Chocolate Cherry Oat Bars Recipe“. 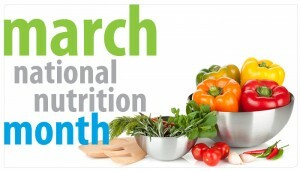 Support National Nutrition Health Month. You and your kids will be glad you did. Please contact our Memorial or West University office if you have any questions or would like to schedule a complimentary initial exam for you or any member of your family.